Free Shipping Included! 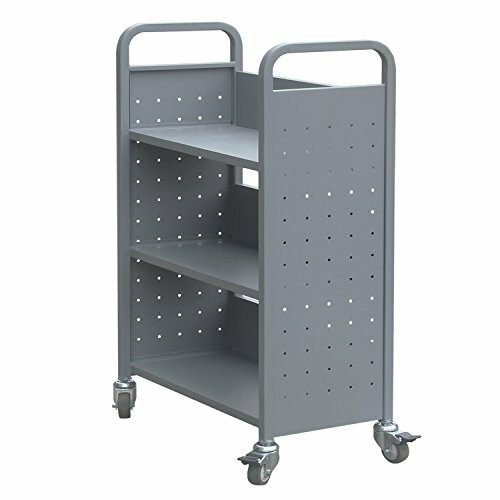 Heavy Duty Book Carts with 3 Single-sided Book Shelves, Rolling Book Storage Rack with Lockable Wheels 200lbs Capacity by H&A at Momiji Studios. Hurry! Limited time offer. Offer valid only while supplies last. Utility carts, also known as service carts, are used for securely storing, organizing, and transporting equipment, supplies, refuse, and materials. Utility carts, also known as service carts, are used for securely storing, organizing, and transporting equipment, supplies, refuse, and materials. They are suitable for use in library, industrial, manufacturing, and maintenance applications, as well as in the home. Lifetime warranty for our book cart, if you have any problem, please feels free to contact us any time.